Algonquin’s defense and offensive line helped the Tomahawks take down the Marlborough Panthers 17-7 at Kelleher Park in Marlborough Friday night. 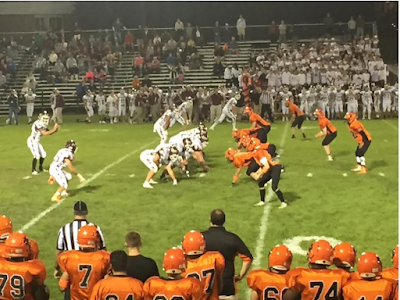 Algonquin’s (2-0) victory over Marlborough (1-1) is the T-Hawks' first win over the Panthers since 2001. “We were just happy to fight, and to do the little things that we needed to do,” Algonquin head coach Justin McKay said after the game. Although their defense was not as dominant as it was in their Week 1 win over Nashoba, Algonquin's defense made plays when it counted. The opening drive looked promising for the Panthers. Marlborough senior running back and captain Luke Goulet rattled off runs of 15 and 22 yards to put the Panthers inside the Algonquin 25-yard line. The Tomahawk defense bore down and stopped the Panthers from converting a 4th-and-8 from the Algonquin 22-yard line. Senior quarterback Evan Schmidlein completed a pass to Kevin Short, but Short was brought down just before the first down marker. Algonquin’s offense worked its way methodically down the field. Aided by their offensive line, running backs Max Cerasoli, Brett Sherman, and Alec Looby ran the ball through the Marlborough defense. Algonquin continued to rely on the ground game as the second quarter began. Max Cerasoli ran past the chains on a 3rd-and-3 from the Algonquin 12-yard line. On the next play, Tomahawk tailback Marcus Ellis punched the ball in from the one-yard line. John Polymeros’s extra point gave Algonquin a 7-0 lead. Marlborough went to the air on their ensuing drive. Algonquin’s defense prevented a big play, forcing a 4th-and-3 from the Marlborough 42 yard line. The Panthers, looking to regain momentum after Algonquin’s touchdown, turned to sophomore punter and backup quarterback, Dominic Carter. Lined up to punt, Carter took the snap, ran to the left, and broke a couple of tackles to pick up the first down. However, just four plays later, the Tomahawks put the Panthers in another fourth-down situation, and Carter punted the ball away. The Tomahawk offense went four-and-out on their next drive, and Marlborough got the ball back on their own 46 yard line with 1:36 remaining in the first half. Luke Goulet demonstrated his agility, running to the right side on 3rd-and-2, then cutting back across the middle while breaking tackles to pick up 18 yards for the Panthers. Marlborough was unable to capitalize, as Algonquin senior lineman Jack Gerulskis sacked Marlborough quarterback Evan Schmidlein for a loss of nine yards. Algonquin’s defense continued making big plays in the third quarter. Senior defensive back Chris Skinner intercepted a tipped pass at the Marlborough 19-yard line with 6:30 remaining in the period. Six plays after Skinner’s interception, Max Cerasoli scored from four yards out. John Polymeros’s extra point stretched Algonquin’s lead to 14-0. Marlborough answered with another trick play, and once again, Dominic Carter contributed. Carter received the pigskin on a reverse and completed a 28-yard pass to Kevin Short on 3rd-and-18, giving Marlborough a first down at the Algonquin 30 yard line. Just two plays later, the Tomahawk defense responded with a big play of their own. Senior defensive back Drew Reynolds intercepted Evan Schmidlein with 1:17 left in the third quarter. Leading by two scores, the Tomahawks stayed on the ground as the fourth quarter began. A couple of Algonquin penalties pushed them back, and the Tomahawks were forced to punt at their own 34-yard line. The Tomahawks forced a four-and-out on Marlborough’s next drive. On the ensuing Algonquin drive, Ryan Barry completed a 32-yard pass into double coverage to Brett Sherman on 4th-and-8 from the Algonquin 34-yard line. Four plays later, John Polymeros kicked a field goal to give Algonquin a 17-0 lead with 7:29 left. The Panthers were not done yet, however. After returning the ensuing kickoff to their own 45-yard line, Evan Schmidlein led Marlborough down the field and found wide receiver Kevin Short in the end zone to put the Panthers on the board. The Tomahawk lead was cut to 17-7 with 4:11 remaining. Marlborough’s offense picked up right where they left off when they got the ball back with 1:30 remaining. Evan Schmidlein completed basses to Kevin Short and Abraham Garcia. But once again, it was Algonquin’s defense that made the biggest play of the drive. Brett Sherman intercepted Schmidlein with 21 seconds remaining to seal the deal for the Tomahawks. Although he is happy with the result, Coach McKay wants his team to continue to improve. “Overall, I’m happy with our resiliency, but I want to clean some things up to get better,” McKay said. Coach McKay will see if his team makes improvements in its game next Friday night at 7:00 PM at North Middlesex. Marlborough will look to return to their winning ways at 7:00 PM next Friday night when they host Westborough.